I’m sitting three feet away from Robert Morgenthau as he tells me this story. It takes a second for the words to sink in. I begin to wonder if this is the greatest story I’ve ever heard. On November 22, 1963 Robert Morgenthau was a witness to history. But, for most of his life, he was the one making it, most notably serving as D.A. for the city that never sleeps for an astonishing 35 years. When you do that you get to be the basis for D.A. character Adam Schiff in television’s Law & Order. I am the beneficiary of this you-gotta-be-kidding-me story while sitting in Morgenthau’s museum of an office at Wachtell Lipton in Midtown Manhattan. Morgenthau will turn 98 this summer. He still works five days a week. He apologizes for keeping me waiting for a few minutes. It’s Monday. Always a hectic day he says. I notice we’re dressed the same. Ida Van Lindt, secretary to New York’s D.A.s for 53 years, and now working with Morgenthau at Wachtell, also greets me warmly. She herself has been the subject of a New York Times profile for such longevity. Her desk is covered. She is being kept busy. The near-centenarian’s mind is sharp. Morgenthau even faked me out with an answer to one of my questions. His memory is astonishing. On the menu that fateful day at Kennedy’s home was clam chowder and tuna fish sandwiches. He tells me he does physical therapy, yoga and uses a treadmill to stay in shape. And despite being born when Model Ts were on the road, Morgenthau is still relevant. Just a few days after our meeting he is in the national news. 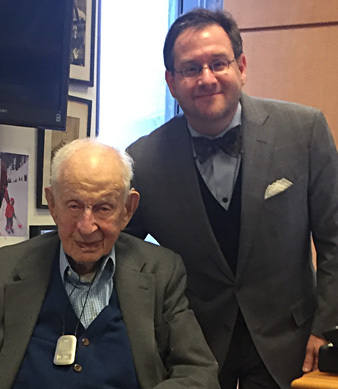 Robert Morgenthau tells me that you can accomplish a lot with luck and longevity. He knows of what he speaks. Morgenthau owes the last seven decades of his life to surviving the sinking of the USS Lansdale, by a German torpedo, while serving in the Navy during World War II. His next ship was hit by a kamikaze pilot but the plane’s 550 pound bomb failed to explode. Morgenthau spent much of his career in the pursuit of public service, a consequence of his wartime experience. He says he made a deal with the almighty while treading water in the Mediterranean after the Lansdale was hit. Get me out of this alive and I promise I’ll do something useful with my life. But public service wasn’t unfamiliar to Morgenthau either. He is the grandson of Henry Morgenthau, Sr., a New York real estate mogul who went on to serve as U.S. Ambassador to the Ottoman Empire during World War I. And he’s the son of Henry Morgenthau, Jr., who served as Franklin Roosevelt’s Treasury Secretary. Being part of a prominent family offered Morgenthau unique experiences, such as making mint julips for FDR and Winston Churchill when they visited his family’s home. Morgenthau is also credited with serving the first hot dog to a member of the British Royal Family. After the war Morgenthau attended Yale Law School and then spent twelve years practicing corporate law with Robert Patterson, former judge of the Second Circuit and Secretary of War. Patterson died in a plane crash returning from a client meeting. Lucky for Morgenthau, he wasn’t with him on that trip. 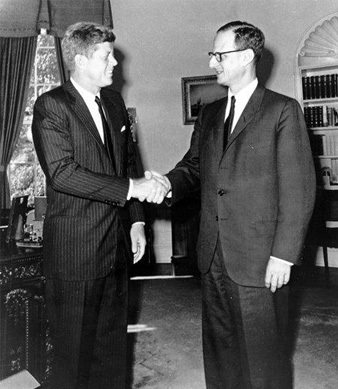 In 1961 President Kennedy appointed Morgenthau U.S. Attorney for the Southern District of New York. He served in the position for ten years – save for a few months for an unsuccessful run for Governor of New York. I tell the former wannabe Albany resident that someone on Ebay is selling Morgenthau for Governor buttons. He looks at me and smiles. Morgenthau’s time as U.S. Attorney ended in early 1970. President Nixon had come into office a year earlier and Morgenthau faced pressure to resign. He resisted it, believing that he had an obligation to portray the office as non-political as well as continue with on-going investigations (including of Nixon supporters). Finally, facing a resign-or-be-fired choice, Morgenthau stepped down. Needless to say, this situation resembles the recent dust-up, less than two weeks ago, between President Trump and U.S. Attorney Preet Bharara, also of the Southern District of New York. Trump asked for Bharara’s resignation. He refused. Trump quickly fired him. The similarities between Morgenthau’s battle with Nixon and the Trump-Bharara skirmish did not go unnoticed. The comparison was reported by major media outlets, including AP and New York’s Daily News, Post and Times. Morgenthau was busy giving interviews on the subject. He said he didn’t know all the facts to comment specifically, but applauded Bharara’s desire to keep the office independent. Descriptions of Morgenthau’s career as Manhattan District Attorney have a trivia-like feel. Thirty-five years in office (1975 to 2009). Winning nine elections. The longest-serving Manhattan D.A. Working with five mayors and sixteen police commissioners (some acting). The third-longest serving D.A. in the country. His office handled about 3.5 million cases while he was in charge. These included such high-profile ones as Mark David Chapman (John Lennon’s killer), Robert Chambers (“Preppy Murderer”), Bernie Goetz (“Subway Vigilante”), the Central Park Jogger, David Berkowitz (“Son of Sam”) and the Bank of Credit and Commerce International (BCCI). Some of Morgenthau’s well-known assistants included Sonia Sotomayor, Andrew Cuomo, Eliot Spitzer and John F. Kennedy, Jr.
And, of course, there’s the most important of all facts and figures. The year Morgenthau took the reigns as D.A. violent crime in Manhattan was rampant. It dominated the public consciousness. There were 648 murders in Manhattan. The year he retired there were 58. Today the biggest crime story in Manhattan is tourists being hassled in Times Square by overbearing Elmos. In a 1995 Op-Ed in The New York Times, arguing against capital punishment as ineffective at deterring crime and draining resources from more promising efforts to restore safety, Morgenthau stated: “To deter crime, punishment must be prompt and certain. Resources should be focused on that goal and on recidivists and career criminals, who commit a disproportionate share of all crime, including murder.” But it wasn’t just violent crime that Morgenthau tackled, he also took on white collar crime, securities fraud and the Mafia. He famously said that crime in the suites is an important as crime in the streets. But, of course, Morgenthau did not do all of this alone. There were hundreds of assistant district attorneys on his staff. A job as a D.A. is often seen as a stepping-stone position. You know the story. Take the job, you won’t get rich, but you’ll get courtroom experience that nobody else can offer. And then, in a few years, you can parlay your trial experience into a high-paying position as a trial lawyer. Morgenthau knows that story too. He explained in “Morgenthau: The Multi-Generational Commitment to Public Service,” a phenomenal 2014 documentary about his family, that stepping-stoners were not the kind of assistants he wanted. He sought district attorneys who were there for the long-term. Like himself, he wanted people dedicated to a career in public service. But how to find such people? And, more importantly, how to weed-out the real candidates from the imposters willing to say whatever it takes to get the job. Henry Morgenthau, Sr. came to New York in 1866 at age ten. The German immigrant didn’t speak English. Six years later he entered City College and eventually graduated from Columbia Law School. This long-ago instilled in his grandson the importance of protecting the rights of immigrants. “I thought we had an obligation to see that current immigrants had the same kinds of opportunities that we had,” Morgenthau explained. Morgenthau is a founding member of the board of Immigrant Justice Corps., an organization started in 2014 by Second Circuit Chief Judge Robert Katzmann. Its objective is to redress the shortage of competent legal representation for low-income immigrants. According to ICJ, individuals facing deportation who are not detained are successful in their cases 74% of the time when they have counsel, and only 13% of the time when they don’t. IJC is a two-year fellowship program that pairs law school and college graduates with non-profit organizations, in and around New York City, to help immigrants navigate the complex immigration system. Since its founding, IJC has served 28,000 immigrants and their families. Its 93% success rate in cases is nearly seven times that of cases without lawyers. 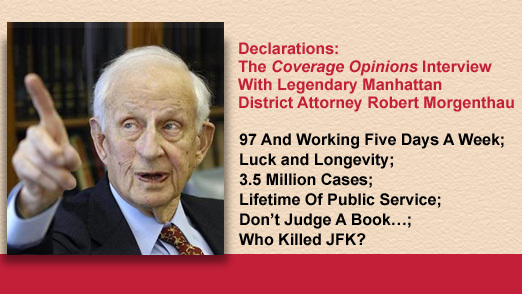 Robert Morgenthau spent nearly a half century on the public stage. Not to mention that intimacies of his 40-year, and still going, marriage to Pulitzer Prize winning journalist Lucinda Franks, nearly thirty years his junior, are the subject of her recent 400 page book Timeless: Love, Morgenthau and Me. But despite Morgenthau’s life being, literally, an open book, you can’t judge it by its dust jacket. He is awash in contradictions. When 58 year old Morgenthau married 31 year old Franks, New York’s man in charge of law and order tied the knot with a Vietnam War protestor who had once chained herself to the White House fence and emptied balloons of pig’s blood on draft files. Despite a Yale law degree and membership in a family of privilege, Morgenthau chose a life in public service over the more lucrative alternatives. Morgenthau’s job was to keep the city safe, yet he opposed long sentences and capital punishment. He is currently working on behalf of a death row inmate in Alabama. He is the New Yorker’s New Yorker, but also steeped in farming knowledge. A farm in Dutchess County, New York, now operated by his son, and which I’m told produces spectacular eggs, has been in the family for over a hundred years. The gentleman farmer explained to me why all eggs do not taste the same. I tell him I’m dubious. He says he was too, and I need to try them. 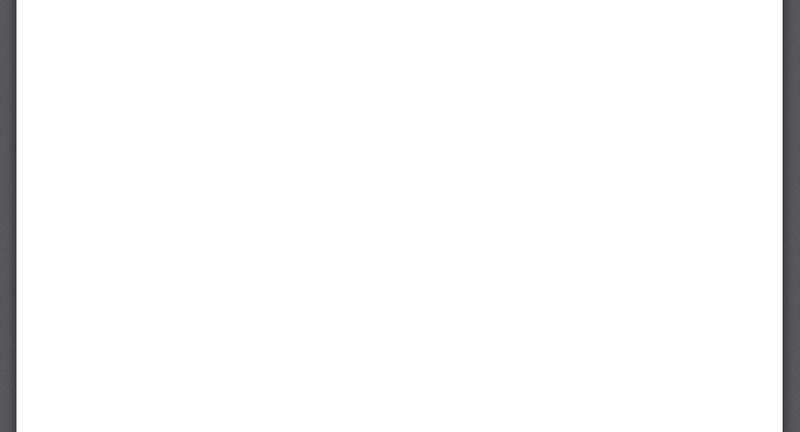 I tell Morgenthau that if I could ask him just one question, it would be this one. His eyes open wide in anticipation. His face says bring it on. Who killed JFK? And, before he can say anything, I add that I’m positive he knows. Morgenthau answers without a moment’s hesitation. “I can’t tell you. It’s confidential.” My response was predictable. And with my eyes now as wide as Kennedy half dollars Morgenthau comes back. “I don’t know. It’s a big mystery.” I hope when I’m 97 I can still pull a gotcha.